Pick Up At Dave The Wine Merchant - G.V. If you're anything like us, it hasn't been too long ago that you were at a party where you and your wine glass became separated. You spend the next few minutes examining every guest's glass to see if it might be yours. These handy glass markers eliminate that age-old problem. 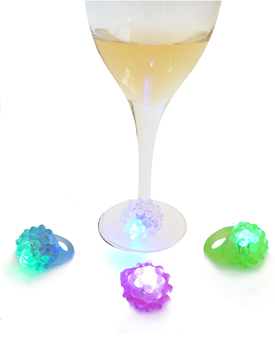 Waterproof, silicon rings that stretch to fit around the base of your wine glass and make it easily identifiable as your own. Go ahead, test it out - set down your glass with one of the markers on it and see how it patiently flashes to you from across the room saying "come hither and pick me up". Four color-coded rings per set.